To become a successful real estate entrepreneur it takes a special mindset. A true winner’s mindset will include an everlasting desire to learn and take risks, using past experiences to shape a path for success. As an entrepreneur, mindset is everything. Everyone would agree that a successful real estate investor does not think the same way as a W-2 employee. There are certain skills which are crucial to have. As an owner of your own organisation, whether you wholesale a single deal a month or own thousands of units, you think differently than someone working for a set salary and climbing the corporate ladder. There are plenty of schools of thought on this topic but the one distinguishable trait every successful entrepreneur has is a passion and drive for success. This intangible component is not only important to achieve a desirable goal or outcome, but it’s a key building block in one’s professional success. As a new real estate investor, the entrepreneurial mindset is everything. Although I may be still fairly new to the game, I’ve been blessed to have great mentors and have learned a tremendous amount from them and the importance of mindset. If you want to consistently have success in real estate, you must not blame others or other factors when a deal doesn’t work out. People who do this are always going to have issues, not to mention, it comes off as unprofessional. If you’re trying to become a bigger player in your market, you’ll absolutely want to lose this habit. You want to always take 100% responsibility of your actions, this can be difficult for some people and in all honesty was tough for me, but it’s essential to take full responsibility for your choices and actions. Those who blame the market, clients, or other investors, will always continue to have issues. When you take responsibility for your actions, you open yourself up to a lot more opportunities. I recall getting frustrated early on because my area was tight and the flow of deals was very slow, almost to a crawl, however, when I stopped looking externally and thought about what I could do better to do more deals, it was almost unbelievable how things turned around for my business. Don’t try to be a hero, learn from other folks and their mistakes and successes. If you’re not taking advantage of other entrepreneurs’ stories or advice, you’re making a huge mistake, I would even say a colossal one. Some real estate entrepreneurs have made mistakes and don’t mind sharing their experiences in order to save other people the headache of falling into the same trap. There’s always those people who feel the need to make mistakes themselves. I know that I have had my fair share of mistakes, but those who can persevere and learn their bits and pieces from experienced investors will have a huge advantage. Always be eager to learn from people who you wouldn’t mind trading places with. If you want to have success in this business you have to be committed to the process and love the grind. You have to love the grind because life is a grind, being a real estate entrepreneur and having the courage to pursue your own venture is hard. A lot of TV shows or Gurus on the radio will try to portray real estate as a get rich quick platform and an easy avenue for wealth, don’t believe them. To have success in this business you must be willing to work very hard and to put in the necessary hours to not only get your business of the ground but to be profitable. Gurus like to show the checks their students are getting but rarely talk about the late nights and early mornings these people grind out to make it possible. The bottom line is most of their students give up because it’s too hard, but those willing to put in the work and that have the right mindset can have enormous success. Remember, there’s no such thing as an overnight success, you have to love the processes of your business and stay committed to it through the good and bad times. In order to have success you must have a relentless mentality to never stop learning; it’s a mindset that one must nurture and understand to lead their business to success. While not all entrepreneurs are experts, the successful ones always have a broad skill set, which is attributed to their thirst for knowledge. Whether inside or outside of their business, if there’s one thing every real estate investor needs to do, it’s continual learning — and developing a strong real estate business mindset will help. The common denominator among successful entrepreneurs is their passion for learning. As a new investor it may seem hard to stop and take a breath during a busy day in order to learn something new. However, it’s critical to set aside a specific time each day, even just an hour, to actively expand your knowledge of the real estate business. The desire to learn is a rewarding asset that will fuel you throughout your real estate career, it should be a never-ending requirement. While learning is an essential component in any successful business, the ability to be open to change and to continue to improve one’s self is a vital and necessary element to the entrepreneur mindset. Ask any successful entrepreneur and they will tell you the ability to learn from mistakes was one of the most important reasons for their success. The key to growth as an entrepreneur is admitting you don’t know everything, and never will. In fact, entrepreneurs face new challenges every day and will find themselves in uncharted territory with very little experience. That said, the majority of successful business owners view their mistakes as a lesson, rather than a failure. They use past experiences as a stepping stone to identify what they did wrong, and how to not repeat it. In essence, the difference between successful people and those we never hear about is that those who fail don’t give up. While it is true that sometimes mistakes can lead to dead ends, while other times they can surface new opportunities. 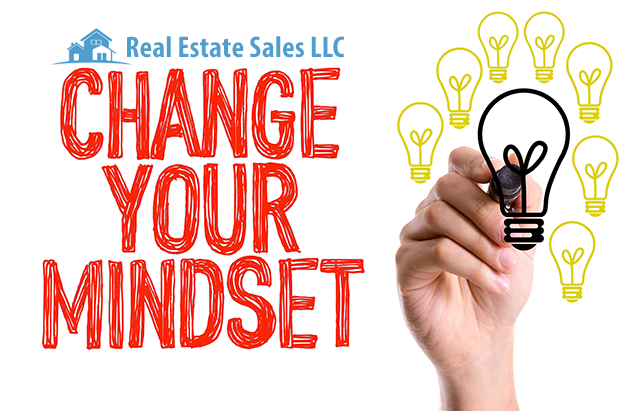 To become a successful real estate entrepreneur it takes a special mindset. A true entrepreneur mindset will encompass a ceaseless desire to learn and take risks, using past experiences to shape their path for success.There’s never an easy road to success. For those who aspire to have financial freedom, real estate can fulfill that dream. I really enjoy learning from and partnering with people who share the same vision and passion in real estate that I do. Make sure to surround yourself with folks who have a positive outlook as negativity can bring an individual down quite quickly. Negativity breeds negativity and if you surround yourself with these type of individuals it won’t be long until you pick up some of their traits. Always remember that the mind is a very powerful thing, don’t ever stop learning and working on your own, because if you do, I can assure you that this will be when you and or your business lose your edge. I am confident that any individual with the right mindset can achieve their goals, no matter how lofty his or her goals might be. There will be many folks that will tell you why you can’t and won’t succeed, don’t listen to the folks and always follow your dreams, it may not be easy but don’t give up as the end result will be well worth the journey.